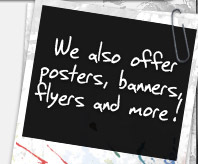 acuteFX Design offers a speedy, cost effective print design service to the whole of the UK. We have a large portfolio of print designs (take a look), and have experience designing all sorts of print-material from business cards and flyers, to posters, billboards and exhibition displays. 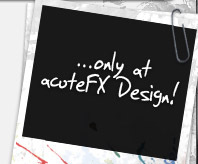 Don't settle for pre-made templates - let acuteFX Design build you attractive, custom print material. We design at print-standard resolutions (300DPI, 600DPI or Vector) and can offer the finished work in a Photoshop, PDF, JPEG, EPS or PNG format - perfect for home or professional printing. 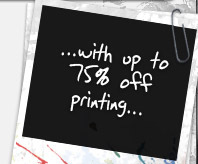 We also have an on-going relationship with VistaPrint and Printing.com, allowing us to offer up to 75% off printing and delivery. 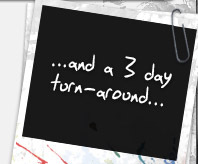 Turn around times including design, printing and delivery can be as little as 3 working days! All basic designs start from just £35! 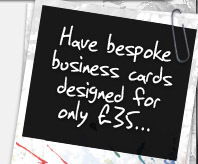 Design projects such as Business Cards, Flyers and Posters all start at just £35. For large prints (e.g. banners) or designs of a complext nature, please request a quote here.